Choosing a midsize family car isn't easy. With excellent choices such as Chevrolet's Malibu, Honda's Accord, Nissan's Altima and a plethora of others, it's more of a personal and emotional choice than one based solely on objective criteria. There is one exception, however. It's Hyundai's Sonata Sport 2.0T, the field's only "turbo four" cylinder entry instead of the industry-standard optional "six." 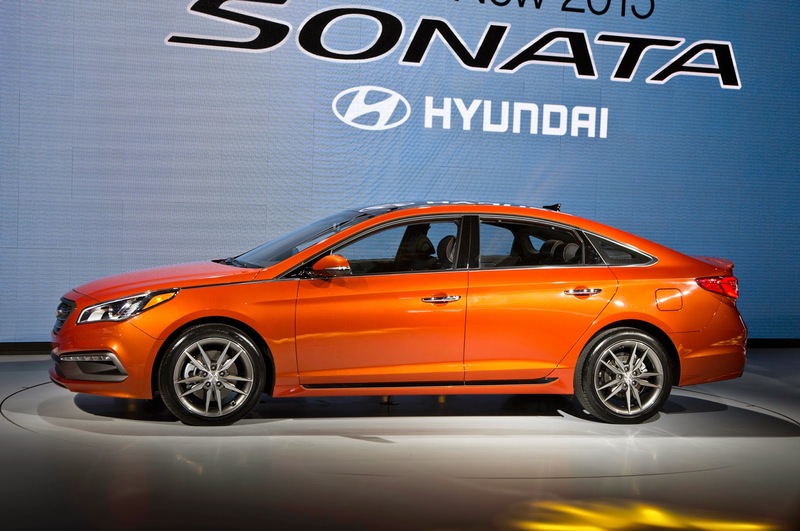 With many more built-in features than its rivals and a base price of $29,250, the 2015 Sonata Turbo is clearly a different animal. By now you're probably wondering if the 245-horsepower turbo "four" offers an advantage over competitors' "sixes." In theory, yes. An engine with two fewer cylinders has less internal friction and is lighter by about 125 pounds. Turbo power plants recover much of the energy stored in regular gas (most such engines require premium, but not this one) by putting exhaust gas to work spinning its turbo. In theory, such factors should make this metal beast far quicker and more economical than its rivals. 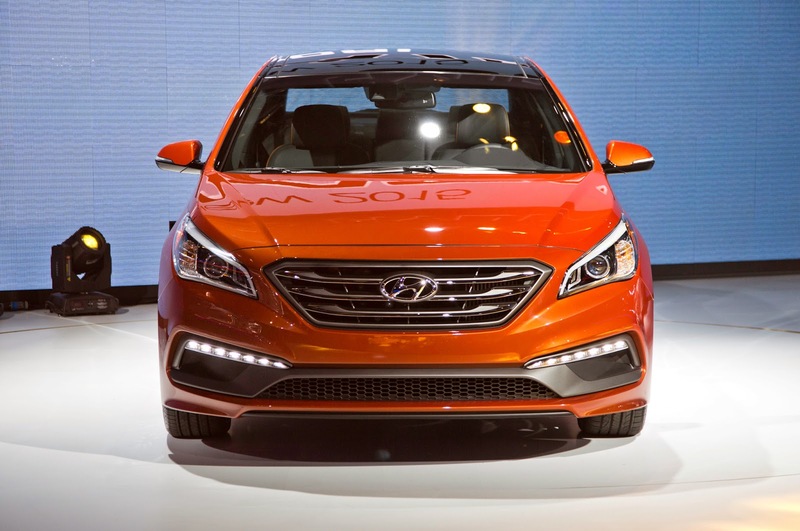 The Turbo Sonata's 2.0-liter engine pulls this front-driver from zero 60 in 8.4 seconds. That's adequate and a second quicker than its non-turbocharged siblings. In EPA mileage testing, the Sonata Turbo returned fuel mileage of 23 city and 32 highway, decent numbers for a 3,505-pound vehicle. Real-world testing disclosed that 18 miles per gallon in metro areas is a more likely number, with 27 on freeways. This vehicle isn't built for racing, and these figures shouldn't be one's sole judging criteria. Many other factors make the Sonata Turbo attractive. Inside, the Sonata Sport 2.0T is both spacious and luxurious. The heated power leather front buckets are wide, with enough room even if you're wide or tall. Between them is a huge console with adjustable cupholders. A 5-inch touch screen is in the center of the dash; it's where most vehicle functions are controlled. It's confusing to master, but it's not as bad as numerous other vehicles. The steering column tilts and telescopes, making it easy to find the right driving geometry. In back, the 60/40 fold-down seats can yield extra cargo capacity. The trunk is of moderate size, and a temporary spare tire hides under its floor. Safety hasn't been forgotten. There are airbags behind nearly every interior panel. Stability and traction control are standard, along with antilock disc brakes on all four wheels. A blind-spot monitor and rear back-up camera will guide you in many situations. The hands-free trunk opener, keyfob entry, dual-zone air conditioning, electric power steering, daytime running lights, xenon headlights (no more powerful than standard units) and more work well. Blue Link, Hyundai's version of General Motors' OnStar safety system, is free for a six-month trial. There's a similar arrangement for the satellite radio. The Infinity sound system (from Fiat Chrysler) includes an AM/FM/CD/HD/MP3/iPod/USB/Bluetooth unit. The system produced just average sound - even though the Sonata is a very quiet car - and fringe-area reception was marginal. The transmission was a six-speed automatic with steering wheel paddles. It shifted flawlessly. The unit also has three driving modes ranging from Economical to Sport-plus. After experimentation this reporter simply left it in "Eco." Though there were some clearly felt differences between the modes no objective measurement was sensitive enough to quantify them. Handling and ride both benefited from the "Sport" suspension. The car handled well through corners and nicely but firmly dealt with huge potholes and similar road hazards. The U-turn circle was 36 feet, somewhat better than average for the class. Ride, the opposite of handling, always stayed firm ... but not too firm. It was obviously tuned to compromise with handling, and this it did well. You'll never hear a complaint from anyone about the Sport 2.0T's ride. Turning to the warranty, you get five-year, 60,000-mile bumper-to-bumper coverage. The powertrain receives 10-year, 100,000-mile coverage. You also receive five years of Roadside Assistance. Though these warranties are the best you can get, you'll still need to purchase one of the extended warranties offered by the dealer. Read them carefully for deductibles, co-pays, exclusions and other such items. Buy the best extended warranty you can afford, as auto repair prices are extremely expensive. Overall, the Turbo Sonata has many attractive features. Even the engine, modern in design but disappointingly slow, can be lived with. The Sonata line features a Turbo Eco model, which reportedly is quicker and returns better mileage than the Sport 2.0T. A hybrid model is available, too. The warranty, fine quality and numerous standard features make this Hyundai and its sheet-metal brothers desirable. It’s an all wheel drive car powered by a V/6 engine, 311 horsepower on regular gas via an 8-speed automatic transmission with paddle shifters and three modes including ECO, snow and sport. I recently had the all-new 2015 Hyundai Genesis AWD 3.8 V/6. It’s an all wheel drive car powered by a V/6 engine, 311 horsepower on regular gas via an 8-speed automatic transmission with paddle shifters and three modes including ECO, snow and sport. This seems to be more the normal, and this is where it stops and the affordable, luxury/performance upscale sedan begins. The 2015 Genesis base price is $40,500 destination $950, with a long list of standard equipment that is optional in most cars. Here is a short list – stability and traction control, ABS, nine air bags, HTRAC all wheel drive, high performance gas shocks, five-link front and rear suspension, 18-inch wheels, auto headlights, daytime running lights, LED accents, heated leather steering wheel, eight-inch screen, Hyundai blue link by Google, seven-speaker audio, plus more. The best warranty in the business, 10 year 100,000 mile power train, five year 60,000 mile new car warrant; this alone shows confidence from the factory to you, the buyer. Now to a few options. Signature package – power tilt panorama roof with power shade, power tilt and tele steering wheel, HID head lights, auto dimming mirrors, blind spot detection, rear cross-traffic alert, power rear shade and rear side manual shades, Tech package, ultra leather seats, seven-inch TFT LCD cluster display, lane departure and lane assist (this actually adds force to the steering wheel to keep you from leaving the lane). Power seat extender, smart cruise control, front and rear parking assist, heads up display, premium DIS navigation with 9.2-inch screen. Lexicon 17-speaker discrete logic audio system, plus more all for $3,500, grand total MSRP $52,450. Make no mistake, $50,000 for any car seems a lot of money. For all that this car offers, it rivals cars that are double-plus the price, and the competition cannot match the warranty. Look around the car; it’s hard to believe this is a Hyundai. Even the Hyundai (H) emblem has been reduced in size, and the grille looks like an expensive import. The body lines and tail lights have been all restyled and fit in with all the other expensive imports. Everyone that looked at and drove the car could not believe this was a Hyundai. My wife drove the car for a day and was also very impressed; she said it reminded her of a more expensive import. Body panel, body lines and fit/finish were perfect. The interior is spacious and comfortable. A push of the power trunk release button and the electronic trunk opens and there is plenty of space. A push of the electronic truck closer button and the truck quietly closes. EPA 16 city, 25 highway, combined 21 miles per gallon.